You can grow a lovely flower garden simply by direct sowing seed of annual flowers at the start of the season. Starting seed in the garden is easy and inexpensive, but it does require some patience. You won't see many flowers for the first couple of months, but after they start, they will bloom until frost hits. Unlike perennial flowers, which generally take two years to start blooming, annuals are quick growers and very eager to get down to the business of blooming. Most of the annual flowers on this list will start flowering within two months. That might not be as fast as purchased seedlings, but it will be a lot cheaper. A lot. You'll also get many more plants, which is perfect if you are trying to fill in spaces in your garden or cover a lot of ground. One final bonus point for starting from seed—most of these plants will reseed, giving you free plants next season. Although most of the hundreds of the Centaurea species are perennials, such as mountain bluet (Centaurea montana), the old-fashioned bachelor's button (aka cornflower) is an easy-growing annual. These can be sown in early spring, around your last frost date. The seeds like a chill and the young seedlings can handle cooler temperatures. 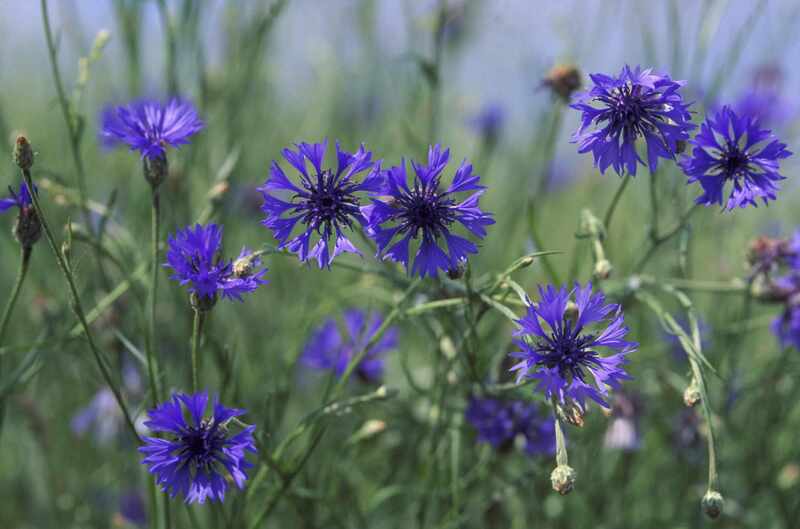 You can reseed them in mid-summer for a succession of blue blooms. Bachelor's buttons also attract beneficial insects, including lady beetles and lacewings. Calendula, or pot marigold, is another lover of cool temperatures that can be sown in early spring, right after your last frost date. They are no relation to common marigolds (Tagetes sp. ), although they are often yellow or orange and look vaguely similar. In United States Department of Agriculture hardiness zones 8 and up, calendula will bloom throughout the year. The flowers are edible, with a citrus-like flavor. Older varieties are single flowered, but now there are frilly doubles in unexpected colors. The singles seem to reseed more readily but not to the point of being a nuisance. You won't find an easier flower to grow from seed. Cosmos will grow in the worst soils, springing up into tall, frilly plants with flowers ranging from pastel to neon colors. They are quintessential cottage garden flowers and also make themselves useful when scattered in the vegetable garden to attract pollinators. They don't start blooming until midsummer, but they make up for the delay by not stopping until frost. Sow the seed after the soil has warmed a bit after your last frost date. Cosmos bipinnatus is the most commonly available species, with daisy-like blooms on branched stems. They make great cut flowers, too. Besides patience, annual flax otherwise requires little effort on your part. It is slow to germinate, so mark the planting area so that you don't accidentally plant something else where you've put it. Companies tend to sell seed in mixes, so if you are looking for just blue or just pink, you may have to order from a catalog. Sow the seed after your last frost date. The plants themselves can be floppy, so it helps to interplant them with sturdier flowers, such as perennials, for support. Deadheading will keep them blooming throughout the summer, and they will usually reseed themselves. Marigolds have become somewhat ubiquitous, but that should tell you something about how easy they are to grow. In fact, if you're looking for a plant to grow with kids, marigolds are a good choice. Their large seeds are easy to handle, and they are very reliable growers. Direct sow seed after all danger of frost has passed, or start them indoors, four to six weeks earlier, and move them out. Pinching young plants encourages them to bush out and set more flower buds. Marigolds are nice as a border in the vegetable garden. They deter rabbits and may help control some types of nematodes. If you are seeking a fast-growing vine to cover a wall or screen out a view, look no further than morning glories. Plant them once and enjoy them for years to come. Morning glories are prodigious self-sowers. Some people consider them a nuisance, but you can usually mow down any extras and keep them in check. This is another plant that does not transplant well and lends itself to direct sowing after your last frost date. The seeds have a very hard outer covering that germinates faster if it is scarified first (nicked or rubbed with sandpaper) and then soaked in water overnight. If you do want to start these seeds indoors, you must use peat or paper pots so that you can plant the whole pot. Morning glories are late bloomers, often not flowering until August or later. Some people have referred to them as the "back to school" flowers. The plump, round seeds of nasturtiums are easy to plant and easy to grow. They tend to produce a mound of round leaves first and then nonstop bright, cheerful flowers. The whole plant is edible, even the seeds, which make great fake capers. Direct sow them after the ground has had a chance to warm in the spring. Soaking and scarifying the seeds will improve germination. They germinate quickly and do best in a lean soil, with regular water. Nigella's common name, love-in-a-mist, is an apt description, with its lacy foliage and halo. These plants have taproots, making direct sowing the best option. Sow them early in spring by just sprinkling seed on the ground. They need light to germinate, so do not cover them with soil. The plants tend to tire out, and reseeding monthly will extend their bloom period, especially if you like to leave the interesting seed pods on the plants to mature. With luck, they will reseed for you. The blooms work well as a cut flower, and the seed pods dry well and look good in displays, too. Whether annual or perennial, poppy plants are worth growing just to watch the drooping buds burst open and raise their heads high. Annual poppies do not like being transplanted. Direct sowing is optimal. You can sow seed in early spring, even before the ground has thawed. They need some light to germinate, so do not cover them. Just press down on the seeds so that they make good contact with the soil. They take a while to start growing, but when the weather warms, they will shoot up. Most varieties will reseed. After the seed pods dry, you can shake the flat-topped seed heads throughout the yard. If you get too many volunteers, they are easy to weed out, and you can always deadhead them and prevent the seed pods from forming. Every gardener should grow sunflowers at least once. What greater thrill is there than planting a seed and watching it grow 6 or more feet in the air? Some of the tallest produce only one flower, but it's usually a very large flower. If you want more blooms on your flowers, look for the branching varieties. Sow the seed after the soil has warmed. Young seedlings will need protection from animals and birds. You can cover them with an old seedling tray. After they're up and growing, they won't need much care, other than protecting them from squirrels and birds. The taller varieties can get top heavy and may need staking. Deadheading the branching types will encourage more blooms. Sweet peas like cool but not cold temperatures. Gardeners in areas where spring goes right into a tropical heat wave will have the toughest time growing sweet peas, and they might prefer to start them indoors, a few weeks early. Also, plant them like clematis—with their feet in the shade and their heads in the sun. In frost-free areas, grow them during the fall and winter. It's worth looking for the scented varieties. They are wonderfully perfumed. Scarify and soak the seeds before planting; otherwise, you need to be prepared to wait weeks for them to sprout. Keep plants deadheaded, as after they start to go to seed, they will stop flowering altogether. They make great cut flowers, so snip away. Colorful, freely blooming and super drought tolerant, zinnias are one of the fastest-growing plants from seed. They are true annuals, not just tender perennials grown for a single season. They seem to know they have only a limited amount of time to flower and seed, so they naturally get to work quickly. Direct sow them as soon as the soil has had a chance to dry out and warm up. They don't like being transplanted, and direct sown seed will catch up and possibly pass by any transplanted seedlings. Zinnias are another good choice for growing with children.